Let’s apply what we have learned into special techniques practice-quiz. Before you are 10 problems, try to take your time to solve them. If you really cannot solve them, take a look at the answer. Answer: In the promotion zone of course! 9-7 and 3-1 columns in a,b rows are correct. 6a, 6b, 4a, 4b are directly protected by the king, so the rook would be taken. Problem 2 – good bishop drop? Consider the opponents’ pieces in hand. Answer: Correct answer is bishop drop to 5e, forking both lances on 9a and 1a. Immediate drop of bishop to 8b(2b) is answered with rook drop 9b(1b) which protects the lances and gives opponent the initiative. Other squares are protected by opponents’ pieces, especially 7c and 3c with the knights. Problem 3 – good fork? Only one good answer! Answer: rook drop to 4e is the only good answer. Other possible moves you might have thought of: rook drop to 6a – the rook can be taken by the bishop; rook drop on 2b or 2c is answered with lance drop to 2b, protecting the bishop; finally rook drop to 3e is answered by bishop escape to 4c or 4g with promotion and protecting the gold. Problem 4 – do you need to protect with the pawn drop? Answer: Generally yes, you need to drop pawn to 8g. If you don’t, then the opponent will drop his pawn to 8g, trapping your bishop. Problem 5 – do you need to protect? How? Answer: Yes, next pawn promotion to 8g is a huge threat. You need to take the 8f pawn by your pawn or silver. Problem 6 – you are in check! What do you do? Read 3 moves ahead. Answer: Gold takes on 5h, knight takes and promotes on 5h, king retakes. You are safe. Did you remember about knight mandatory promotion? Problem 7 – mate in one move. Two possible answers. Answer: Mate in one with knight drop 6c or 4c. Problem 8 – mate in 3 moves! Can you find it? Answer: Gold drop to 9a, king 8b, rook promotion to 8a! The power of the dragon! The rook to 6b with promotion is simply blocked by gold drop to 8b. 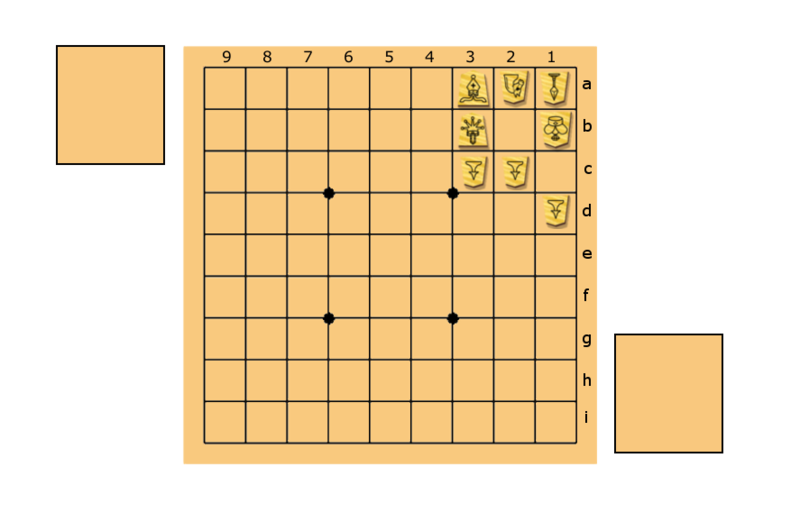 Problem 9 – mate in one! Do not let the king escape. Answer: Bishop promotion to 2b. Gold to 2b means the king can run to 1c and onward. Problem 10 – your king under attack. Two possible answers? Answer: No, only one. Pawn drop to 7i. Pawn drop to 8i is a nifu (double illegal pawn)! The quiz finished! How did you do? Some of the problems were difficult, so do not worry! Just remember the good answer for the future.